So with recent daytime temperatures reaching into the 70’s and 80’s, water temps are on the rise. The high waters from this past winter have all but receded, and the lakes and rivers are coming to life. And with the mercury rising, the river dwellers are waking up; white bass in particular. Every year around the end of March or the beginning of April, white bass begin their spawning run up the creek arms and rivers which feed many of our NC lakes and reservoirs. These small to medium sized specimens are voracious feeders, and many who chase them throughout the year in NC swear they are, pound for pound, among the hardest freshwater fighters anglers can target. It’s not just how hard they pull, but how long they can go on feed. They are often found schooling, or busting the top of the water column chasing bait fish on cloudy and windless days. And they are also fantastic table-fare. I prefer them fried but they are also great grilled or even pan-seared. So I went to fish the northern creeks of Jordan Lake this past week, before the temps took a nose dive this week. I figured the run could be starting, even though notes in my journals suggested to wait a while longer. I couldn’t wait it out any more. Upon arrival I noted the water was still cool, and started to fan cast around some areas that have been good to me in the past. Nothing. Not a sniff. I paddled to a few different areas and was afforded the same luck. Too cold I thought. It was last Monday and I’d played hooky from work (it’s ok I’m the boss), and I was starting to think I might ought to rethink the days’ activities. But then I decided to try a little trick I’ve learned will fill a stringer on days these particular fish seem lock-jawed. I opted to troll the shallows with a weightless in-line spinner. It’s a delicate strategy, but often proves beneficial when cast and retrieve techniques aren’t panning out. One does not need a lot of line out, nor will you need to paddle fast. I prefer to let out about twenty feet of line and paddle around 1.5 to 2 mph. I was quickly glad the boat hadn’t found the bed of the truck prematurely. Within moments of starting to troll in an area I had confidence in, I had a big fish on. I thought it was probably a large mouth bass; until I saw the stripes. 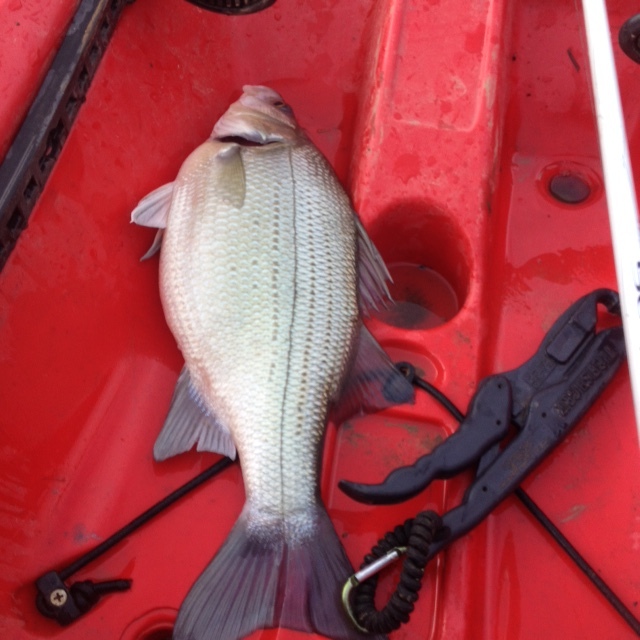 The fish fought hard and after bringing it to the kayak, I realized it was a really big white bass. I didn’t have a scale but I was planning on keeping fish for the fryer. So I would weigh it later. I didn’t even have a measuring board, but I knew this fish was a big female. 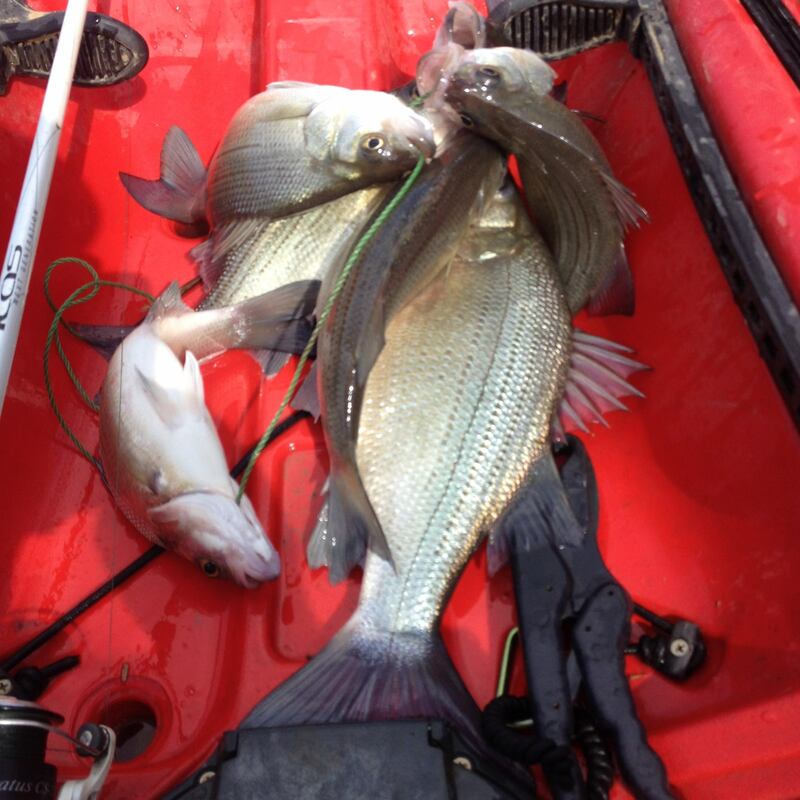 White bass have no size minimum for the creel, but I try to release any fish less 12″. This one turned out to be 17.5″ and just under 3 pounds; a trophy by length and weight from NC waters. I trolled another few hours up until the clouds finally broke and caught several more big females. I caught all the fish on a brown haired, #3 inline spinner. The fish seemed to completely disappear when the sun showed itself around midday, but I had a nice stringer of fish for the fryer and one in particular I needed to weigh. Once home I found a digital scale and realized I had indeed caught a citation white bass. The minimum length and weight used to be exactly the same as a crappie, but the length has recently moved up an inch from 16″ to 17″. I’ve released multiple whites over the last few years that have been trophies and regretted it, so I took this one to Howard Walters at Furs, Feathers & Fins Taxidermy. Howard did a deer mount for me this past winter and has become my most trusted taxidermist. His quality of work, pricing and timeliness are second to none in my book. I have been out to the lake 3 times in the last 2 weeks and caught whites each time. 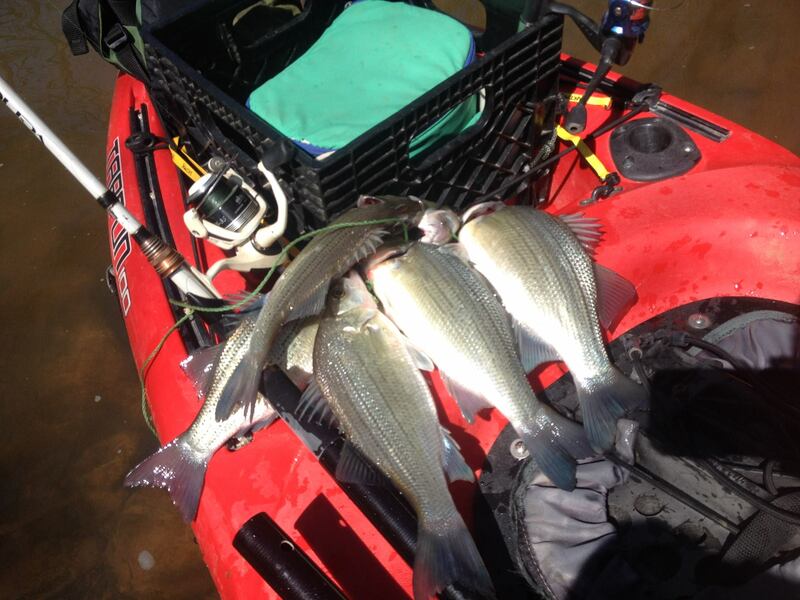 They are biting in rivers and creeks that feed lakes or impoundments with white bass present. 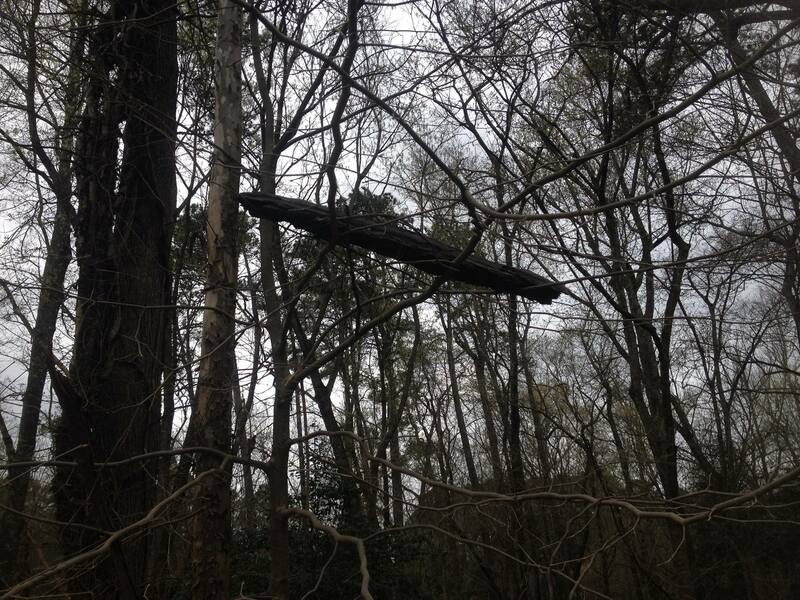 I hear the bite is going really well on the Eno River as well. These fish will bite when others are lock-jawed, but I do prefer to fish for them on cloudy days with light winds. So get out there and take some in-line spinners with you. You’ll most likely get a stringer full of delicious tasting fish, and you might just get a wall-hanger for your troubles as well.